Junie Yeo has always had a flair for fashion – particularly fashion-oriented businesses Better known today as the founder of the cheongsam brand, Lark and Peony, Junie’s business acumen became clear at just 19, when she opened two clothing and ethnic wear stores at Far East Plaza while pursuing her diploma in Mass Communications. Today, Junie’s online cheongsam business is booming. Her creations are semi-casual and modern, and are each limited to less than 30 pieces. This preserves the exclusivity of each design; she also follows a strict policy of not reproducing any previous pieces. There were various inspirations for her cheongsam business, she says. The first was a trip to Japan that opened her eyes to the country’s unique fashion, which had no limits but also emphasised subtle beauty. Another source was a friend, who had complained years ago that it was rare to find cheongsams that were both affordable and beautiful. There were two ends of the cheongsam spectrum then: the beautiful ones were extremely expensive, while cheaper pieces were of poor quality and often gaudy. Her creations are a play on both fabrics and textures, drawing inspiration from different cultures. Another inspiration was Junie’s mother, Mdm Janet Yeo, who encouraged her daughter to start her own business and be her own boss. Cheongsams from Lark and Peony are often unique in design, fabric and texture. Junie’s style, her desire to walk her own path, encourages her to push the boundaries of print. But she also doesn’t forget who her cheongsams are for; she stays away from more childish designs. Junie draws inspiration from different cultures, incorporating not only their motifs and styles but also traditional fabrics. She employs materials from all over Asia: Japan, Korea, Singapore – even Australia. 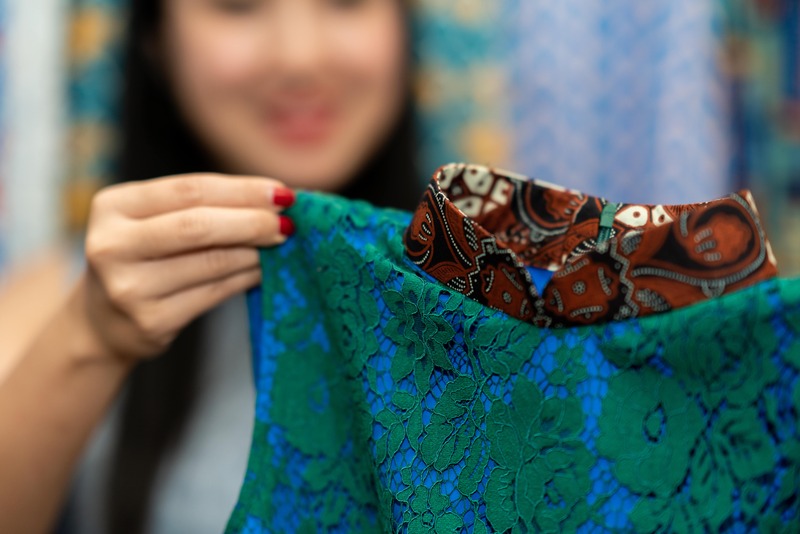 Junie’s cheongsams are tailored from fabrics all over the world, from Japan, South Korea, Australia and other parts of Asia. 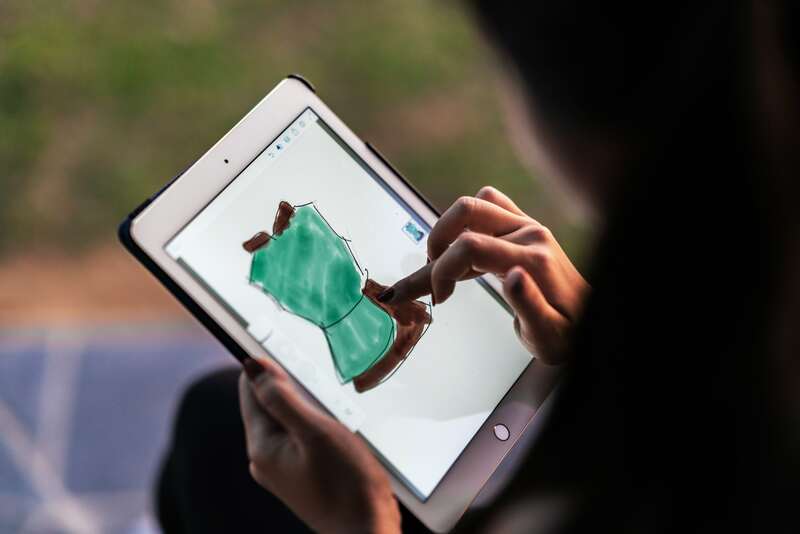 In creating a cheongsam, Junie starts with the fabric and draws inspiration from it when sketching her design. She considers not only how creative, colourful or playful the end product should be, but also how the design can highlight the strengths of the particular fabric. From there, she creates a technical drawing that she sends to her tailors, who make a pattern for her seamstress to cut out before everything is put together. When the final product reaches Junie, she conducts a quality control check, turning the cheongsam inside out and making sure everything is perfect before she boxes it up. Junie’s cheongsams are sold online and through trunk shows in her home. Each trunk show is limited to 45 customers and they are often sold out, with many of her fans wanting to get first access to the latest designs. Junie loves working outdoors and close to nature, where she feels she comes up with her best designs. As Lark and Peony progresses steadily into the future, Junie continues on her adventure, seeking out new materials and quirky designs to incorporate into her creations. Check out Lark and Peony’s online store here, or visit their Facebook page here!